There has been a lot of talk about a potential new arena for the Detroit Red Wings. Of course one question that would remain if a new arena does come to reality is its naming rights. The Red Wings currently play in the Joe Louis Arena. It is one of the few NHL or NBA arenas to have never sold its name to a corporate sponsor. With the arena in its final leg of its NHL life, it is doubtful that it will ever see a corporate name, however a new arena would almost certainly sell its name to help pay off construction debt and help itself profit in the future. So naturally for a site devoted to center ices, I have started to ponder what the new arena might be named. One obvious name that comes to mind is Amway, as they have sunk some major bucks into the Red Wings organization in the past few years. In fact I would almost bet money on this deal if it weren't for the fact that Amway already owns naming rights to a professional sports venue in Orlando (Amway Center). It is worth pointing out though, that it is not unheard of for one corporate identity to sponsor multiple professional venues. 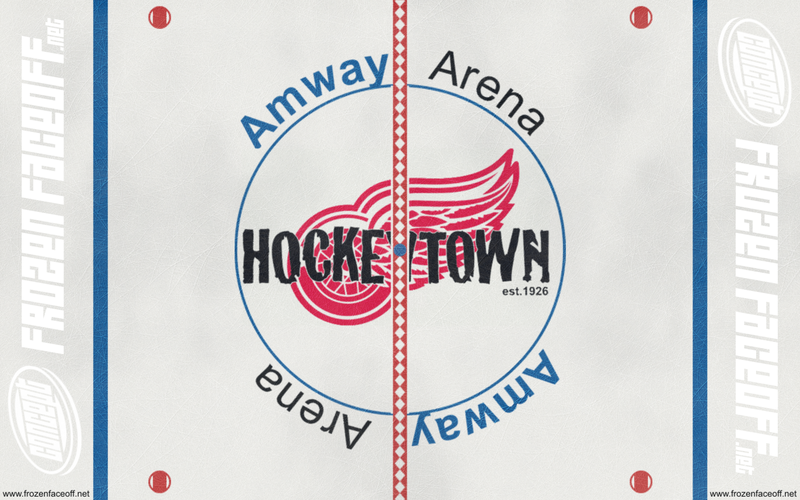 There are many others as well so my official prediction is that the new Red Wings arena will be called Amway Arena and here is a concept of what center ice might look like. What about a motor company? Ford would be an obvious choice for a motor company as they already sponsor the Wings I believe. That might create confusion as there is already Ford Field in Detroit. However if there was a way to build an arena next to Ford Field, that would work out great!